Roz Rowley was named teacher of the year in 2010 by the Braille Institute. After consulting with teachers who had instructed students with learning disabilities, she settled on the Wilson Reading System, which is designed to help those with dyslexia or other language-based learning disabilities, and she subsequently helped adapt it for students who have visual impairments. For her accomplishments, the Braille Institute in 2010 named her teacher of the year for excellence in Braille instruction. Mrs. Rowley, who had hoped to teach until the end of this school year ended, died of cancer April 14 in the Elizabeth Evarts de Rham Hospice Home in Cambridge. She was 70 and lived in Watertown. When Mrs. Rowley returned to teach at Perkins, a few years after graduating in 1964, “it felt like I was back at home and had come full circle,” she told the school publication. Those who had taught her were now colleagues as she settled into her career. When it came time to adjust the Wilson Reading System so that it could be used by students with visual impairments, Mrs. Rowley “was able to scrutinize the program and adapt it in a way that makes sense,” said Justine Rines, evaluations coordinator at the Perkins School. Though Mrs. Rowley was honored for that work, she also created a course in recent years that she dubbed “English for real life.” Lessons focused on how to read want ads and bus and train schedules, and how to write business letters. “These are practical things you need to learn to become employed and independent,” McCall said in an interview. Rosalind Ellen Silverman grew up in Malden, the only child of Bernard and Alice Silverman. Her father worked in the upholstery business, and her mother was a secretary for the city’s Planning Board. 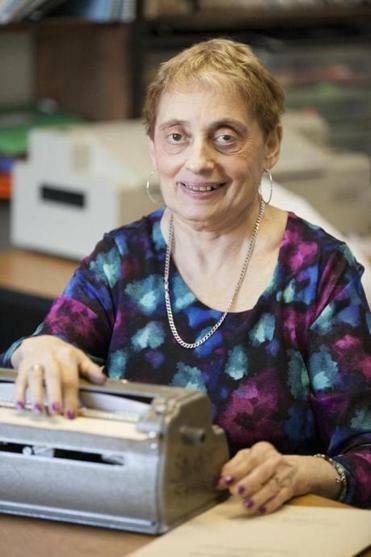 Born with low vision, Mrs. Rowley grew frustrated during her years in Malden’s schools. She was relegated to the sidelines during gym class games and often had to wait for tutors to assist with material that wasn’t in Braille. During her junior year in high school, she transferred to the Perkins School, where she was on the student council, participated in the drama and folk clubs, was cocaptain of the cheering squad, competed on the track team, and was circulating editor of the Echoes literary magazine. A service was held for Mrs. Rowley, who in addition to her husband, Bob, and son, Eric, leaves a stepson, Kevin Rowley of Springfield. Mrs. Rowley was diagnosed in 2000 with cancer that returned and metastasized. When she was being treated in Beth Israel Deaconess Medical Center in November, her husband walked into her room one day to find her sitting next to the window, planning another lesson for students.